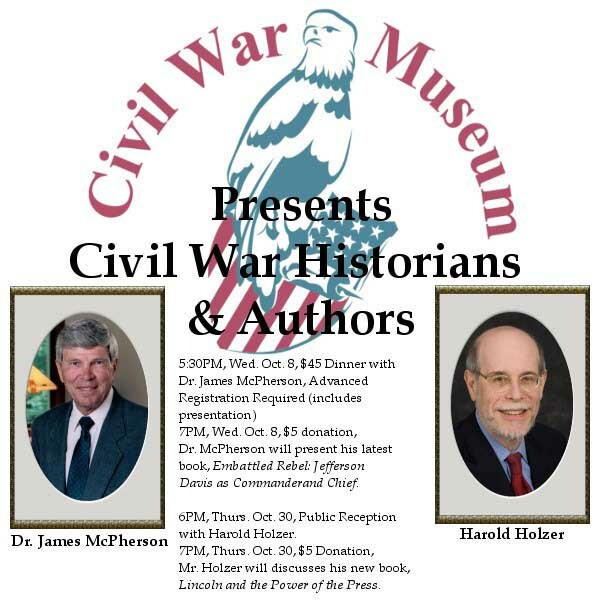 Kenosha, WI, September 25, 2014 -- /EPR NETWORK/ -- The Kenosha Civil War Museum is pleased to welcome two recognized Civil War historians and authors to the museum for presentations and book signings. At 7pm on Wednesday, October 8, Pulitzer Prize-winning author Dr. James McPherson will present his latest book, Embattled Rebel: Jefferson Davis as Commander and Chief. Join Dr. McPherson at 5:30pm for a dinner before the program. The cost is $45 for dinner and the program. Advance registration is required by calling 262-653-4141. A suggested $5 donation to the museum will be accepted at the door for the program only. Visit www.TheCivilWarMuseum.org for more details. On Thursday, October 30, Harold Holzer discusses his new book, Lincoln and the Power of the Press. A public reception begins at 6pm, followed by the program at 7pm. A suggested $5 donation to the museum will be accepted at the door, and advance registration is not required. First edition copies of the books will be available for purchase and signing the nights of the events. The Civil War Museum in Kenosha is a war museum like no other. It focuses on the Civil War from the perspective of the people in the six states of the upper Midwest: Illinois, Indiana, Iowa, Michigan, Minnesota and Wisconsin. The other two locations, the Kenosha Public Museum and the Dinosaur Discovery Museum are just a quick trolley car ride (adults, $1; kids ages 5-12, $0.50.) away. Free parking is available in the scenic lot on the lake shore. All three locations truly are a MUST SEE for everyone! This perfect day trip for the whole family is only 25 minutes from Milwaukee and 55 minutes from Chicago. Kenosha Public Museums offer a wide variety of classes and workshops for all ages. For more information visit www.KenoshaPublicMuseum.org or call 262-653-4140.